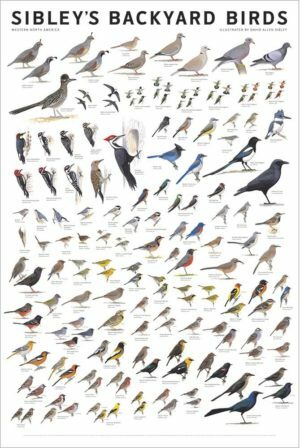 The Sibley Guide to Birds – the most popular, most comprehensive, and fastest-selling printed field guide to North American birds – is now available in digital form as an app for several mobile phone platforms. Scroll down for a description of features. FAQ and trouble-shooting is here. 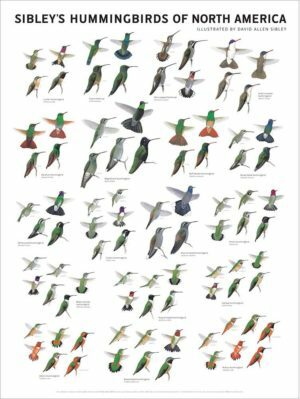 The entire content of the Sibley Guide to Birds – over 6600 images, every word of text, 800 range maps – along with the songs and calls of nearly every species… and all in your pocket! Want to test it before you buy? For iPhone and iPod you can check out the Lite version for free at iTunes. 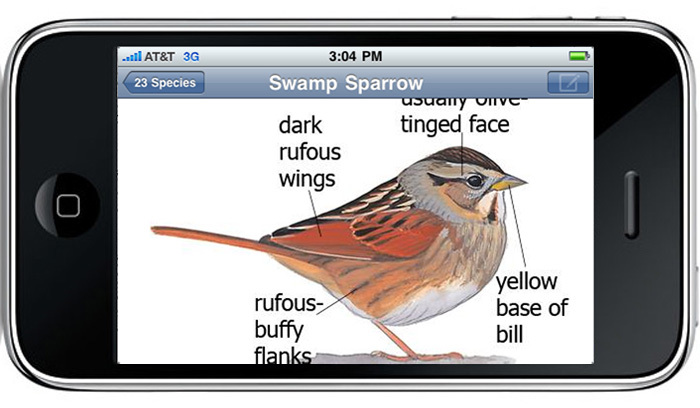 This is a fully functional version of the app that includes only 30 species. See how it works before you buy. Lite versions for other platforms are coming soon. In designing this app I wanted to make the navigation easy and intuitive, requiring a minimum of “taps” or “clicks” to get to the important information. The updated interface uses swiping motions to navigate: up and down for images of the same species, left and right for other species. Buttons for map and sounds are on the upper right. A tap on the image expands it to full screen, swiping your finger up and down scrolls through all images of the species, while swiping left or right moves to previous and next species. Turning the device expands the image further to fill the screen in landscape view, swiping up or down scrolls through all images of the species. Tapping the text instantly makes it full screen, and rotating to landscape view increases the size of the text for easier reading. Maps are now higher resolution and can be viewed full screen. Comparisons of any two species (or even two variations of the same species) are easy to set up, and swiping either species up or down scrolls through all images of that species, while swiping the top image left or right moves to previous or next species. 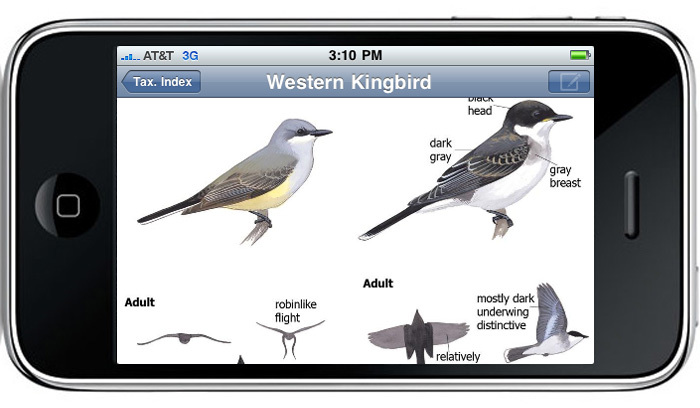 Comparison species can also be viewed side-by-side in landscape mode simply by turning the device. Tapping the "voice" icon while in the compare screen makes it easy to compare songs and calls of any two species. As of the Feb 2013 update, search results show a thumbnail of the bird, and the species names can be displayed in French, Spanish, or Latin, as well as English. The iPhone and Android versions are essentially identical to each other in content and functionality, with only very minor differences. The biggest differences will be seen in the lower resolution screens of some devices running Android OS, but when comparing the app on devices with similar screens users should see virtually no difference between them other than a few inherent differences in user interface. The Blackberry app includes all of the content and virtually all of the functionality described for the Sibley eGuide (including regional filters as of May 2011), but currently does not include the compare feature found in the iPhone and Android apps. The compare feature cannot run on the small screen of many Blackberry devices, and there are no plans to add it to the Blackberry app. Most Blackberry devices are not operated by touch screen, and therefore the user interface is quite different, but navigation is still quick and easy using the scroll wheel and hardware buttons. A discussion forum for users of the product can be found here, please feel free to join in, leave comments, tell us what you like or don’t like. We will be continuing to develop the program. Does the Sibley eGuide to Birds app work on Ipad, too. If so, do I need to buy an app for Ipod & one for Ipad? The eGuide app as it stands works on both the iPhone and the iPad, and you can buy one copy and use it on both devices by syncing to the same computer. It’s nice to see the images and text at the larger size on the iPad, but the functionality and the images themselves are all the same as on the iPhone/iPod and we have no immediate plans to develop an iPad-specific app. I bought the app for my iphone which worked great until the phone died. I now have an android phone so I’m wondering if i can or about to transfer my app to my new android phone? I am having a problem transferring my Sibley eGuide from my old phone to my new phone. but I get a box saying it’s not licensed. I do not want to buy something I’ve already paid for. Hola buenas tardes, puede indicarme por favor como puedo adquirir la guía con aplicación para blackberry. I guess it’s April for the BlackBerry version? Yes, it will be April. I’m told the final version should be ready to submit to the Blackberry app store within the next few days, and hopefully approval and posting to the store will be quick. Need the Sibley guide for Windows 7 phone!!!! Please develop an app for the new htc arrive WP7. I just bought the android version. Do I have to purchase the iphone version separately? Just to be clear – the app can do everything for me that the printed books can do? I’m not missing any functionality through the app? The app includes every image and map from the books, and almost all of the text from the “big” Sibley Guide as well as Eastern and Western Field Guides. The text from all three books is combined in the app, so it doesn’t match exactly what is in the books, but nothing significant is left out. 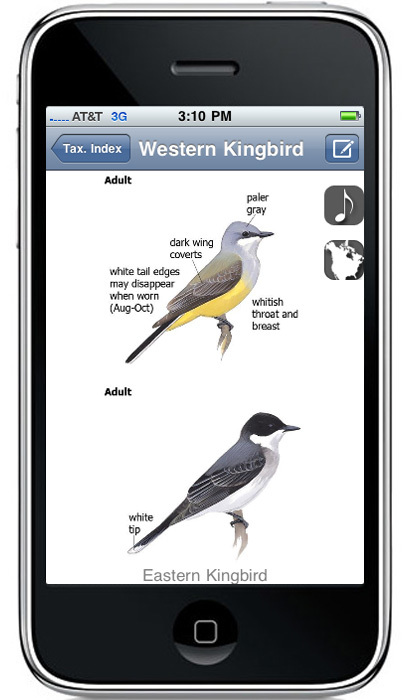 And of course the app adds audio for over 600 species, and searching and filtering by region and other attributes. The app does not include the “Family comparison pages” with thumbnails of all related species lined up for comparison. Other advantages of the book include being able to see two full pages (images, text and maps) all at once, and to browse or compare many species very quickly by flipping pages (the app views only one or two images at a time). Thank you for all of your helpful answers, David. I have one more question: will a free trial be offered for the BlackBerry version? Is one of the planned improvements the ability to add notes other than in a sighting log — something that would be associated with the species, rather than with a particular date? Good suggestion, Thanks! I will ask about adding this. For the personal notes, it would be nice to have a switch on the text screens to turn personal notes on or off for all species. Options to upload or type notes would be helpful. Going on vacation from the East Coast to Palm Desert area of California on April 28, 2011. Any chance the app for Blackberry will be available by then? Good news! It should be out just under the wire for you. I’m told it will be submitted to the Blackberry store on Friday, and approval should take just a couple of days. Early next week April 26-27 is likely. Since the app is quite large (350MB) it is recommended that you download it to a computer and install on the phone from there. It should be a straightforward process using iTunes on your PC to download the app and install it on the phone. Let me know if you have any other questions. How big will the BB version be? Will it work on all phones? I have a touchscreen Storm2 with a little under 100mb. Looking forward to adding your app. I recently purchased an IPad and am interested in purchasing your Eguide to Birds. Based on the large file size, it would appear that this is a stand alone application not requiring Internet service in order to use the app while birding in the field. Is this correct? Hi Paul, Correct, all of the content is contained on the device. There is no need to access the internet once the app is downloaded. Is it possible (or will it be possible) to add mp3 files of my own (e.g. downloaded from Xeno-Canto) to a species of my choice? It would be really convenient to be able to open up iTunes and put in additional calls and regional variation (it’s already a really nice collection, and this would help make it into a customizable master library). The french bird name are available ??? French bird names are not available yet, but I’m working on the list and will add that in a future update. A free demo version with only few birds will be nice! It can help evaluate the user interface, the sound and image quality….etc. Has the app been released for the Blackberry yet? Sorry about the delay. There is still no word on the Blackberry app. I was told it would only take a couple of days for approval but apparently it is taking longer than that at Blackberry. I’ll post as soon as I know more. When does the Blackberry app come out? Oops, sorry. I forgot I already posted this question. Didn’t mean to post twice. I see a Blackberry version is coming out shortly. Is there any chance that a version for the new Blackberry Playbook might appear soon? The 7 inch tablet is the perfect size for birding. I find the iPad a bit too big to be handy for carrying. Will the blackberry version work on Blackberry “Bold”? Thanks for your patience with the Blackberry app, everyone. It is now available at the Blackberry App World. It should work with all versions of Blackberry devices, although not all features will be available in all devices. Please let me know how it’s working, and feel free to contact me or the developers (or leave a comment here) with any questions or suggestions. Hi David. Just purchased the BlackBerry app. It is very impressive but I have just a couple of issues. One, I noticed you can search for birds by color, type, distinctive features, etc., but I was under the impression you could search by location. Two, there doesn’t seem to be any volume control when playing songs and calls. I found the volume to be quite loud. This is simply constructive criticism as I find the app to be wonderful and I know it will get plenty of use. Thank you. Hi Patrick, My mistake, the Blackberry app does NOT currently include the regional data, and I’ve corrected my post from earlier today. The developers tell me that they had some concerns about setting that up for Blackberry and they wanted to launch the app and make sure it worked well on the variety of Blackberry devices before adding that. If all goes well, they expect to be able to add the regional search filters in an update in about two weeks. That will be a free update. The other feature of the iPhone and Android apps that the Blackberry version does not include is the ability to compare two species on the same screen. This is due to the smaller screen of many Blackberry devices, which simply can’t show two images effectively. I’ve asked them about your volume control question, and will post whenever I hear something. I have a BB Torch which should be able to compare two species on same screen. Any chance it will be available for the Torch? Also if you slide the keyboard out while in the app, it locks the keyboard on the screen when you close the slider and you can not get the keyboard off the screen without exiting and then relaunching the program.Glitch? Hi Mike, sorry to hear that you are having trouble. I forwarded your comments to the developers and you should be hearing from them about the keyboard issue. And we’ll be looking into the possibility of adding the compare feature to Blackberry devices that can handle it, but that’s a more complex challenge. I have a I Phone and love the Sibley app. Wonderful job. Now I plan to buy a I Pad for larger viewing and etc. Can I use the same purchased app on the I Pad and have on both devices? If so how do I accomplish this? Yes, as far as I know you should be able to install the same app on the iPad, as long as both the iPhone and iPad are synced to the same computer and the same iTunes account. I am using the Android version on a HTC Evo Shift. I am getting quite a few “force close” error messages. Once I force close it will re-open without errors. It occurs when I have been in the app and then leave the app without backing all the way out. Thanks for a great program (and the books too)! Hi Sharon, I’m sorry that you are having these problems. I’m forwarding your comment to the developers and hopefully they can sort it out for you quickly. Android Sibley app version 1.3.2. I too am still (10 July, 2011) having this problem (Force close caused when reactivating the application after the device has gone to sleep) on my Droid X2, Android 2.2.2, Kernel 2.6.32.9- The developers are already aware of it. I love this app and I use it in the field. Just one question. How do you delete an entire list? Hi Forest, We should be able to add this option in an update. Hi Judy, I hope your problem is resolved now. The developers have been working on it and the new update just released should help. Fixed offline license reminder continually being displayed, even after opting to refresh the license. Thanks for the Blackberry version! Following up on another comment from last week – I also have a Torch on which the onscreen keyboard locks when I use it. Would appreciate being in the loop for a fix. Added “Introduction” Includes Tips, Introduction and Acknowledgements. Thanks, does version 2 address the keyboard on the screen? Hi Michael, You should be hearing from the developers very soon to sort out the keyboard issue. AppWorld is charging another $30 for the upgrade on the BB. This can’t be right, can it? Hi Richard, No, that is not right. I’m forwarding this to the developers and they should be able to help sort it out for you. To all concerned, those customers upgrading to Version 2 of the Blackberry Sibley Bird application who have been charged for the upgrade, please send an e-mail to support@mydigitalearth.com with your full names, address & tel no. YOU WILL BE REFUNDED. You were not meant to be charged for upgrades, this is an error on our side. It is being rectified by Blackberry Appworld and should be available by late Monday evening the 30th or Tuesday morning the 31st. I wonder if it would be possible to add at the top level a button for (ideally multiple) user-customizable taxonomic list(s) of target birds? Please delete the application from your device, you can do this by going to the “Options” (little spanner icon) in the Blackberry menu, select “Applications” this will display a list of installed applications, select Sibley App and go ahead and delete it. David, I am from Quebec and use your bird guide, Eastern region (french version). Thanks fore a fine product. Hi Michel, I’ve just posted a complete list of French and English names for review. The developers are working on incorporating those names into the app in a future update, so hopefully it won’t be too long. 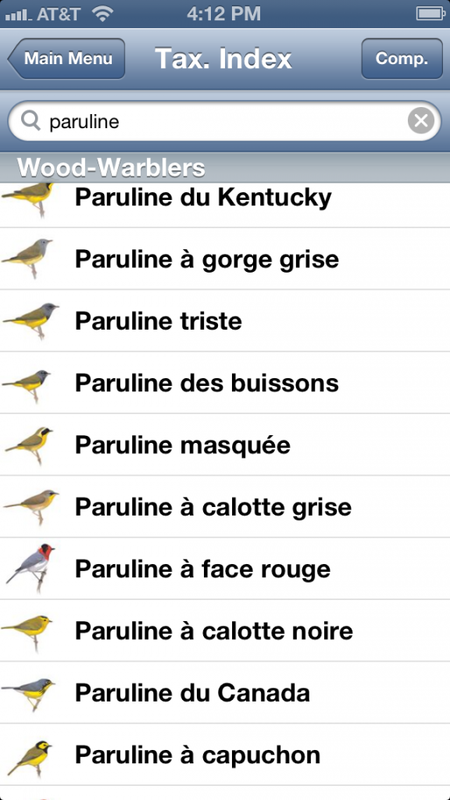 Why do not show the hybrids warblers, on your eguide (ipodtouch) like Brewster’s and Lawrence’s warbler. It perhaps a good idea to integated thase hybrids .! Thank you david it great job and very usufull on the field. Pictures and songs on the same ipodtouch. Thanks very much for pointing this out. The hybrids are in the book but somehow were left out of the app. I’ll make sure they are added to the next update. I really love those very usefull applications! And I work as a nature guide in Costa Rica, the app works very well especially during the migrations, but, are you working on an app of NewTropic Birds (Tropical America) or Costa Rican´s birds? One more thing. Why you does not include a second map to show the “real distribution” of the species? Specially the migrants, I think is important for the conservation of the birds to know what happen with those from México to Argentina/Chile. * Support for large-screen devices (i.e. tablets) including Android Honeycomb OS. 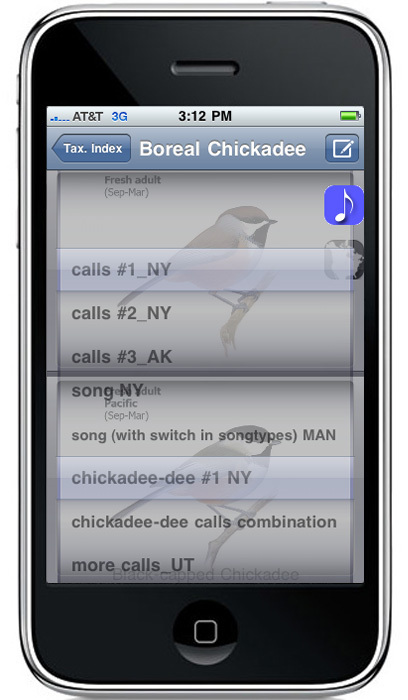 * Added play/pause/stop/repeat functions to birds calls. * Added Import/Export function in My List. Export a backup to your SD card or Email. Import a backup from SD card (includes import preview). * Added menu option to “My List” to clear all list entries. * Added auto-complete on my list fields. * Added history on selection of Location when adding/editing a “My List” entry. * Added feature to automatically search for manually downloaded resource files to provide seamless installation. * Changed installation and title screens to portrait mode only (all other screens remain portrait/landscape compatible). * Fixed incorrect bird call for “Nashville Warbler”. * Fixed incorrect bird information for “Pine Siskin”. * Fixed “fast scroll” popup (taxonomic, alphabetic and smart searches) so that bird taxonomy name no longer go off the edge of the screen. * Fixed search bug where a search query with an apostrophe would cause an invalid/empty result. * Fixed installation verification bugs. * Fixed wifi timeout bug during installation. Hi Michael, Sorry to hear this. The developers are working on the issue and you should expect to hear from them, if you haven’t already. Please let me know if there are any further problems. I tried four times to buy the Blackberry app, but the web site in question is infuriatingly frustrating. Each time, after signing on, I searched for a found the Sibley Guide. I clicked on “purchase” but was sent back to a sign-on page where I once again entered my ID and password. I was then — each time — sent to a page that said that my session had timed out. I was unable to purchase the app. Please tell me how I might be able to purchase it, bypassing the frustrating web site to which I was sent. Thanks. Harvey, I’m sorry to hear about the issues with the Blackberry store. I’ve forwarded all of this to the developers and they are working on the issues. If you haven’t heard from them in a day or so, or if you have any other concerns, please let me know. NB: Please backup your birds list before applying this update (My List -> Export). If you experience any issues regarding licensing, or notifications that the application has been tampered with after applying the update, please uninstall and then reinstall the application. Fixed installation and verification issues introduced on certain devices in v1.3.1. Fixed bug where enabling bird comparison would cause a FC. Fixed issues with application not running on certain tablet devices. I have a Blackberry now but plan to change to a droid in November. If I buy now for my blackberry will I need to buy again for my new Droid if I go that route? Yes, unfortunately. I will check with the developers again but they have explained it to me that each platform is different and the apps are sold through completely independent stores. The Android marketplace has no way of knowing what you bought at Blackberry, for example, and there is no “license” that travels from one device to the other. I have the BB app and it is really great, I especially love the quality of the sounds. I have noticed that it seems like many of the calls are not paired correctly with the “buttons”. 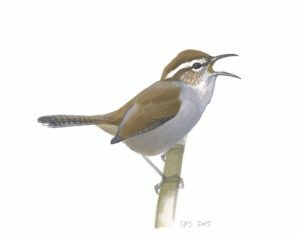 For instance under Brown Thrasher there are 5 calls: smack calls, song #2, churr-calls, teeyoo and smack calls, and song #1. Touching “smack calls” most definitely plays one of the songs, and churr-calls give you a “smack”. I’m using a Torch, not sure if that makes a difference, but I’ve noticed this for some other birds as well. I’m wondering if this is a problem with my install or a bug? Can you confirm that the Brown Thrasher calls are correctly matched to the touch buttons? Or if not, is there a way to fix this? Hi Rob, I’m glad you like the app. I checked the sounds on the iPhone app and they are working correctly. It may be a mixup in the database when it was converted for the Blackberry app, and I’ve alerted the development team to your question. They should have an answer for you very soon. Thanks, I appreciate your attention to this and hope to hear from the development team soon. Will they be emailed me or will this be a general announcement, and if so where would I find this information posted? As pointed out by Rob McDonough. Thank you for alerting us to this issue. Yes we have found an issue with some of the sounds, the sounds for the species are correct, but in a couple of the species the order is mixed up, we have noted this error and will be including a fix for this in the next release (3-4 weeks time). Is there any word on the update that will fix the order of the sounds for certain species, or when the next release will be forthcoming? Thanks in advance. Checked in about a month ago to see if the update to the Blackberry app would be fixed so that the order of the sounds matches the buttons within each bird species. Please let me know at your earliest convenience at the email above. I live in Mexico in the winter and use my Anroid T-Mobil Comet phone in both Mex. & US by changing the sim cards. I am now in Mexico and unable to access Sibley’s. When I try and open it, it says it is validating the license and then says the application has stopped unexpectedly. Please help. There are a lot of cool birds down here and I need the app. Issues…when are all the issues going to be fixed. Why was this setup to require an internet connect to install the app? The file for a manual installation doesn’t even create the correct folder. This refers to the Android version. Looks like a great app if I could get it installed and it worked properly. In response to Brian’s Issue, An internet connection is required for OTA download of the application from the Android marketplace and licence validation. We have recreated the zip file with the full path eProducts\SibleyBirds\ “All resource files here”. When installing the resource files manually you will need to download the zip file http://www.mydigitalearth.com\download\android\SibleyAndroid.zip to your desktop, extract this file to your desktop, this will create a folder called SibleyAndroid, you can then copy the entire “eProducts” folder to the root of your media card. You can now proceed to run the app, the device will be scanned for the resource files and if copied correctly the app will start. You will need to be connected to the internet the first time to validate the licence. Just wondering if there are any plans to release this app on Windows Phone devices? Have the book and it’s great and jealous of it being on my girlfriend’s iPhone. I’ve looked and there is only 1 bird guide app on WP7 but it’s all European birds. There’s a market for animal guides on WP7, hope you guys tap into it. I second Muckey about WP7. It would be top on the Christmas list if it existed. The developers tell me they’re getting close on the Windows Phone 7 version. Hopefully early 2012. What’s the progress on the WP7 app? Sorry I haven’t updated the page here with that info. I will try to get that done soon. Will the Android version run on Android tablets running the Honeycomb version of Android? Specifically the Motorola Xoom. I see the Blackberry Playbook is not able to download this app. Such a disappointment. Any chance of this happening soon? The Sibley guide will work on Android Tablets running Honeycomb. The launch date for the Blackberry Playbook version has not been finalised, it will coincide with the new OS release for Playbook planned for Q1 of 2012. I have downloaded the latest update 1.7 for iphone and ipad. On my itouch I can no longer view past the first illustration for a species. After the first one the screen becomes blank although the scrolling still works. I see there are similar complaints on the itunes website. The developers tell me they have solved the bug with iPod touch and the latest update, and expect to be submitting a new update that fixes it within a couple of days. Thanks for your patience. I was having phone difficulties this AM and got to wondering if the phone went dead how would I keep a copy of my app. It is on an HTC android unit and as far as I can tell it is not backed up anywhere. The application is linked to the Google account with which you purchased it from the Android Market. If your phone is factory reset or formatted then the application would be uninstalled but you would simply need to visit the Android Market and download it again – no purchase necessary. The data for the application is typically stored on the SD Card and should that be formatted, it would require a re-download of the original data again. I am very happy to hear of a bird guide to the windows 7 phone also. Can’t wait for it to appear! I use the Sibley app (version 1.7) on my iPhone 4S running iOS 5.0.1. When I switch to another app and then back to the Sibley app about 95% of the time the Sibley app crashes and has to be restarted – it will not pick up where it left off before switching to another app (by double-clicking the home button). Is this a known problem? Is there a fix in the works? Are you developing the bird and tree app for the Nook tablet? We are currently looking into the Barnes and Noble Nook tablet at the momment. We will definately be publishing the app for this device and will post a proposed release date shortly. Just want to add a “me too” to the request for a Nook tablet version. Thanks and looking forward to it. Still no word on a release date for a Nook version? Hope to see it soon. Sorry I purchased the Sisley app for my I pad and cannot get into the sight. Hi Ed, Sorry to hear that. I’ve forwarded your question to the developers and I’m sure they’ll get it sorted out quickly. Will the eapp work on an ipad2? I too am surprised that it will not work on a Blackberry Playbook especially as Blackberry’s reduced price has resulted in a flood of new playbooks out in general use. I’m one of those who now have a Playbook and am disappointed. I will search out other options especially for calls. One good thing about the Playbook is the easy access to the web via your Blackberry. In Saskatchewan that gives me coverage almost anywhere. 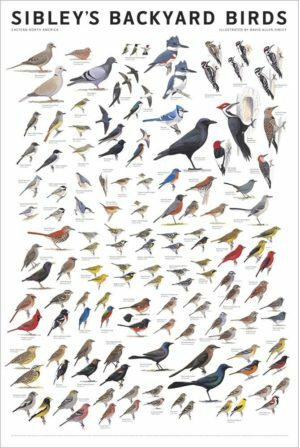 So in the field if I can open some websites with bird songs on them and since I always have paper Field Guides in my car then I might find I don’t need an AP for birds. Of course if I had one and was using it first then that is what I’d get used to. I’m using the iPhone app. The illustrations are beautiful but I wish the search function could be improved. I’m new to birding and it’s hard to identify anything from a big long list of bird names. It would be great if you could improve the browsing. For example, there could be a black silhouette of the most prominent bird in the family and when you click on that, a color icon for each bird. That would help a lot. It would also be great if you could support eBird like some other apps (but that is less important to me than improving the browsing). I hope that’s possible. Jonah, thanks for your comments on the app. I agree the search methods could be better, but for now one solution is to select your state and check the box to “show only common birds”. That will limit the results to the 100 or so most frequently seen species, and if you don’t find a match there you can easily uncheck the box to see all species for the state. Hi Jane, check that the mute button on the side of the phone is switched off (although in latest versions of the app that has no effect on the sounds). I’ve forwarded your comment to the developers, and I’m confident they can get it sorted out. Please also make sure that the application volume is turned up – when you are at a species with a sound tap on the sound and when it is playing turn the volume up (using buttons on side of device). This volume control is different to the main ringer volume control. I have the guide on my android phone and have a kobo ereader tablet that also has an android system. Is it possible to download the program to this device and if so do I need to re-purchase. “If your Kobo reader has a colour display, runs the Android OS and has access to the Android Marketplace then you should be able to install and run the application on your device. You can login to the Android market place with the same credentials you used on your Android phone, browse to Sibley Birds and select purchase, the app store will give you the option to reinstall the app. You will not have to pay again. Any news about progress on a Windows Phone version?? I just heard from the devlopers that the Windows Phone 7 version is ready to submit to the store and should be available very soon. Hi Earl, I haven’t heard of this myself but I’m forwarding your comment to the developers and hopefully they can get it sorted out for you and anyone else having that problem. Wow! This was a quick response. Thank you so much. I am really inpressed with your post-sale involvement with your product. Just have been birding in Florida for 5 days. 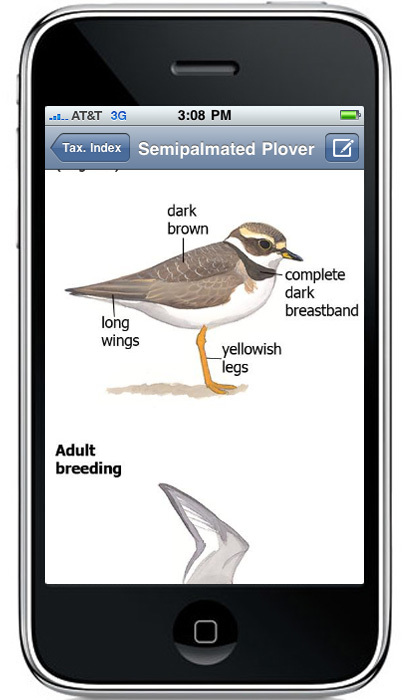 Downloaded Sibley as well as iBird pro, but only used the Sibley app, which to me says it all. Thanks for the compliment and the suggestion. I’ll pass it along and see what can be done. I bought a Blackberry Torch 9810 about a month ago and Sibley’s is one of the first programs I loaded. It works perfectly (of course no touch screen functionality). I love it! I also have a playbook and the new OS 2 on it. I understand it will now play some android apps. Will the Android version of Sibley’s run on that?? Would there be a way of combining the mylists? I’m told that the Playbook version is ready to submit to the store, and should be available within a couple of weeks. I’m just following up to see how the Playbook version is coming along. Thanks Rick, Let us know how if you have any questions! I too am a Playbook OS user……and look forward to your updates. 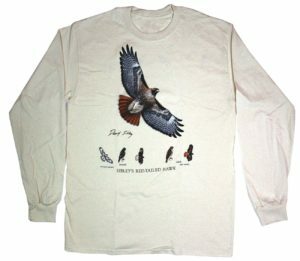 Hope they are in time for the Spring migration period in Ontario. Thank you, thank you. thank you for developing a Playbook version – I am looking forward to getting my hands on it!!! New York list is missing Pileated Woodpecker. Using app on Blackberry. Thanks Sherry, I will check that out and send a corrected list to the developers. At this satge there is no way to transfer an application licence from one operating platform to another eg; If you purchased a Blackberry Version we cannot transfer the licence to Apple, Android, Kindle Fire or Windows Phone 7 and vice versa. This means you would have to repurchase the application for the new platform to which you have migrated. We are going to be looking at some form of coupon system in the not to distant future that may allow us to help ease the burden of swopping platforms. Thank you for patience, understanding and loyal support with the product. 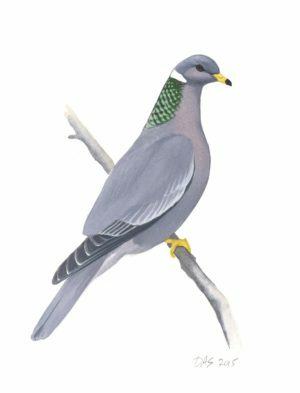 Can you email at list of birds from eBird that is in taxonomic order? I seem to only get alphabetic order? 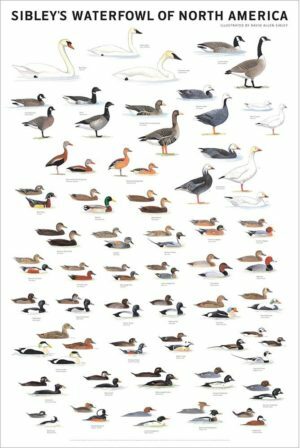 One great thing about the print edition of the Sibley Guide is that it includes an introduction for each category of bird (e.g., loons & grebes, tubenoses, etc.). The intro not only gives useful information but gives a visual overview of birds within the families. Can those introductions be included on the apps, especially the IPad and other tablets which have the larger screens. I’ve recently downloaded the full program from the Blackberry App store for use on my Playbook. It worked fine the first couple times but then the program screen became larger than the playbook screen, effectively hiding the return button. I’ve deleted and re-installed the program but the error is still there. Hi Jim, Sorry to hear that you are having trouble with the app. I’ve forwarded your question to the developers and they should be able to help you out. 1.) Swipe your finger from the top bezel downwards – that should bring up the menu for the current screen as well as a “navigation bar” at the bottom of the screen. 2.) Tap the toggle button at the far right of the navigation bar at the bottom of the screen – this will keep the navigation bar on-screen thereafter. You can always use the top bezel swipe-down gesture to bring up the menu on any screen. Should you wish you can also swipe diagonally up and left from the bottom bezel to perform a “return” gesture, thereby negating the need for pressing the virtual return key in the navigation bar. I hope that helps sort out the issue you are currently experiencing? Hoping you get it fixed so I can enjoy the great features. Suggestion for My List. It would be nice if the My List would appear as though it were a State and could be selected. For example, I’m planning a trip to Michigan in May. I have a list of about 25 species I would like to see. It would be great is I could select My List as if it were a state, and then simply Swipe through the list, working on learning field marks, calls, etc. Of course, having multiple lists would be nice too. Hi. 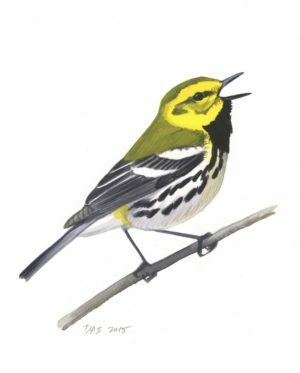 Using the latest version on an iPad, is there an easy way to jump to one of the taxonomic index groups, like “Diurnal Raptors” or “Wood-Warblers”? Or do I just have to scroll down the index list until I find it? I can search for “Ha” and catch “Hawk” and “Harrier”, but then all the other raptors disappear. If I search for “Warbler”, redstarts and waterthrushes vanish from the list. Am I missing an easy access to these gray-highlighted groups? I love the illustrations, comparison feature, and sounds. I just wish I could jump to the groups more easily. Thanks. First, thanks for getting the Windows Phone version of the Sibley eGuide to the marketplace. It has been working well so far. The only glitch I have encountered is exporting the list to Skydrive. I get the following error message – “There was a problem accessiing your Microsoft Live account: NullReferenceException”. The program says it has signed in successfully and the correct permissions for the app are shown in the Windows Live accoutnt. Hi Jim, I’m glad you like the app. I’ve forwarded your question to the developers and they should be able to help you sort it out. Noticed an update for the app in marketplace today. After installing it I tried exporting my list to Skydrive and it worked first try. Not sure if the update addresses anything else, but the export function is now working for me. Thanks to you and your developers for fixing this. Hi, I love carrying “My Sibley” around with me at all times! I have a suggestion on the search, I am using the iPhone version. When you do a search, it should return the family as well as the species. For example, what if I want to look at all the warblers? (this is what I most often want to do.) If I search for “warbler” I will not get Ovenbird, American Redstart, etc. My only other option is to know where the warbler family falls on the taxonomic index. Or is there another way to pull up all warblers? Great idea for coupons to help us migrate from one platform to another. Any update on when that will be available? Hi – I only see app options for iPhone & iPod. Is the guide available for iPad? Yes, It’s a universal app, so one copy works on both iPad and iPhone, with the layout optimized for each screen size. I bought the guide for my iPhone and love it. Can I also access it on my computer? Hi Karen, Thanks, I’m glad you like the app. Unfortunately apps will only run on the iPhone or iPad, not on a home computer. It would be nice if someone could make it possible to view apps on a computer, especially for “reference” apps like mine, but I don’t think that’s happening soon. This may have already been mentioned but I would love to have the ability to create a “target” list of birds. There are many instances when this would be handy especially when you’re in an unfamiliar area trying to see a set of species that you’re unfamiliar with or when working on trying to separate similar species like thrushes, shorebirds, etc. Accepting user input probably creates some programming challenges but it would surely be a great option and perhaps differentiate the app from others too. Hi Steve, Thanks. This is a great suggestion and one that we’ve talked about here for several years. It’s definitely possible and I agree it would be very handy. I’ll ask the developers again about it. A really nice feature would be to use the GPS (if present in your phone or tablet) and current date to create a list of birds likely in your area at the present time. So the app would know you were in the mountains or on the Gulf Coast or in the prairies and would know how to drill down through the range maps to decide what resident, migratory, breeding, or wintering birds to list. I just installed this on my Windows Phone, great app! What is the My Map supposed to show? All I get is the last species recorded on a scrollable black background. “My Map” displays your GPS-tagged bird sightings on a global map. A black background indicates that the map is unavailable. This is likely caused by either the mapping functionality being blocked or unavailable on your device or no network connectivity being available and therefore the maps are not able to download correctly. We have opened a bug report and it will be investigated and subsequently fixed in the next update to the app. Thank you very much for bringing this to our attention. I love my Sibley Guides, both the book and the app on my iPhone. I am thinking about switching to an android becuse of the larger screen. Will I have to purchase the app again? Will this be available for Windows 8 RT? I need windows for work & would like to use this app on my new tablet. I have an iphone I use in the field. Thanks! I just got an Android phone and am thinking about buying this app, which looks great. Will updates be included for free when the revision of the Sibley Guide comes out in 2013? Is there any schedule on this plan yet? I was about to buy the full app but I’d hate to buy it and have support/updates ended and feel like I’d want to buy the new version right away. Hi John, I understand your concern. Discussions are ongoing. One thing I can tell you is that it will be over a year before any major new version is ready. Hi. I am running the Sibley’s app on both my iPhone and iPad. Is there a way that the list that I basically now only have on my iPad also be installed on the iPhone and vice versa depending on which device I decide to use? I do have the list exported via iTunes and saved on my PC, but it would be great if there was a way to mirror the devices without having to put the information in on both. Please let me know. Thank you. A few other users have also asked for this functionality and we can see that it would be useful to be able to store My List in the “cloud” and have it synchronized across devices. We will be looking into this for future updates of the app. I am looking for a good birding App (or even a good field guide) that covers Costa Rica. Any suggestions? Hi Richard, there are a couple of really good field guides to Costa Rican birds, but no apps as far as I know. A 2007 guide by Garrigues and Dean is has range maps and larger illustrations, and is much more portable; while a 1989 guide by Stiles and Skutch has a lot more info. Just got this app and am very impressed, but I can’t see any hybrid images. Am I missing something or are they not included? Hi Reuven, The hybrid images are not included in the app now. The trick is where to put them, and that question has been put aside as we worked on other things. It’s coming, though, and hybrid images will be included in a future update. How does this app work on the new Windows 8 smartphones? I had been using the iPhone version. I now have purchased the Android version on a Samsung Galaxy S3. I liked on the iPhone version that I could click on a bird on my list and it would go to that bird so I could review the Sibley information on it. This can not be done on the Android version. When I want to see the Sibley information on a bird on my list, I have to leave my list, do a Taxonomic Index search to find the bird, and then read the information. Please add the iPhone feature to the Android version. Everything else works great. This feature will be included in the next update to the Android version due to be released very soon. I really enjoy the app and would suggest the capability of searching the species with the Alpha/Bander’s/4-letter codes of the species. That would be quite useful. I purchased the e gude for my Blackberry but have not been able to successfully install it. I tried reinstalling according to instructions but still no success. Is it possible to speak with someone who can help get it working? Another option would be to switch my purchase to my Samsung tablet although that is my second preference. Sorry to hear that you are having trouble with the app. I’ve forwarded your questions to the developers, and they can definitely help get it sorted out for you. I don’t seem to be able to get iTunes to give me the update – at least, I don’t see any “thumbnails” after downloading again. Since I can’t find anywhere on this website what the latest version is numbered [you have hidden it pretty well, anyway], I can’t tell for sure; mine says version 1.5. Or maybe this update doesn’t apply to iPodTouch? NB. This Application WILL ONLY work on an iPhone, iPad or iPod Touch running iOS V4.3 or higher NOT A NORMAL IPOD CLASSIC/NANO and the download is about 400MB. I’ve already forwarded this to the developers, but if you are still having trouble or if you have any other questions please don’t hesitate to ask. What are pub/release dates for new Guide and Ap, please? Hi Bobby, The publication of the printed guide is planned for spring 2014, and the app will be updated around the same time. I am considering purchasing a Kindle Fire HP, but want to be certain I can get your e-Guide on that device. I did a search on Amazon and resulted in: Your search “Sibley eGuide to Birds App” did not match any products in: Kindle Store. Hi Debbie, Thanks for your interest. I’m told there were some issues with the latest update on Kindle, and the developers are working on fixing those and getting it back into the Kindle store. I’ll post when I know more details on that. Now that Blackberry has the new large, touch-screen BB10 smartphone version out in most countries (in the U.S. it will be available in March) will you make it available and can the form factor be ported to the BB10? Also, will it be available for the Blackberry Playbook 7″ tablet? Please excuse my ignorance, just got my first iPhone. I bought your ap for the phone. Does this give me anything for my iPad or iMac? Hi Bobby, the same app will work on an iPad, but not on a desktop or laptop computer. Thank you, but is that an additional purchase? No, this is a “universal app”. You buy the app once and can install it on any device that is linked to the account. For example, as long as you use the same Apple ID to manage your iPhone, iPad, and iPod touch (most people do) you can have the same app on all of those devices. Did not want to accidentally purchase another copy. It’s great, but $40 would have been a bit much. 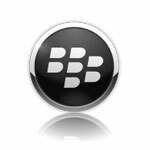 Will there be a Blackberry 10 app in the near future? There certainly will be a BB10 version of the app in the very near future. We are currently in the process of finalizing the development and testing and the app will hopefully be ready very soon. Sorry that we cannot at this stage provide a concrete launch date but we are aiming to have it out within the next month. I just purchased the app for my iPod and I’m enjoying it immensely. My only frustration is the measurement units. Is there any way to change them to metric (ie, linear measurements in cm, body mass in grams)? If not, I would strongly recommend this as a revision in the next update as many of your clients reside in Canada. Thanks Ken, That is an important point and it is on the list of things to add in a future update. I had this great app on my Blackberry and changed to Android os. I found out that I could not transfer the app since it’s a different os. Seems like this should be seamless after paying $30. So I won’t be buying this all over again. Hope Mr Sibley is updating hard copy guides! Hi Lainie, If we could offer a universal purchase that would work on any device you owned, we would. That is a limitation of the different companies involved. The best we can offer is one app that works on all Android products, one for all Apple products, etc. But when you switch platforms there is no way to transfer the app. I wish it were different, but this is the same with every app you buy. Some time ago we purchased the Sibley’s app for a Blackberry 9800. The song volume was very low and the volume control buttons had no effect. We assumed the Blackberry Device was faulty. Subsequently we acquired a Blackberry 9810 and downloaded the Sibley’s app to that. Same situation – very low volume and the control has no effect. We have had others with more expertise than us take a look at it and their belief is that the app itself is the problem. I’ve heard your app on other devices and know that they can achieve significant volume. Can you please explain this apparent limitation we are experiencing with the Blackberry version? Thank you. We have not experienced very low volume on the BlackBerry version of the app but we will investigate immediately and hopefully release a fix soon. Thank you for bringing this matter to our attention. Is there a way to add sound for species where it is not already included? For example, Red-whiskered Bulbul is tickable in Miami (according to some sources, the drawings are in the app but no sound, but sound is available in XenoCanto including a recording from the Kendall Dr area of Miami. Is there a version of the field guide app that will work on the Microsoft Surface running Windows 8 RT? We are in the process of finalizing the Win 8 version for tablets, Surface will be supported, this should be available in the next 6 weeks. We will post a launch date shortly. I loved this app on my Iphone, recently upgraded to the new BlackBerry Z10 but this app isn’t available yet! I’m just curious if the app publisher is taking any steps to make it possible, at the least, make the android app available to side load on the BlackBerry. Is there a version of the Sibleys app which will work on the KOBO VOX? Hi! Any status on the Blackberry Z10 version? It’s the spring migration and I’m lost without it!! Downloaded the new Blackberry Z10 version yesterday & already using it profusely. Better than the old version. I love it!! Just in time for spring migration on Lake Erie this weekend! THANKS a million! I see you are about ready to release to the Win 8 Surface. I have the Android version, but just got the new Surface Pro (not the RT). Will the new version support native Windows 8 on the Surface Pro? I really hope so as I’d be first in line to get a copy! The Windows 8 version has been submitted to the App Store and is currently in the approval process. The App will run on a Surface Pro device running Windows 8. I have a Samsung Galaxy S 3 and have the Sibley bird app installed. I have two questions. There are times when I can not get any sound on the bird songs/calls. Sometimes it happens right after I was able to get the sound. I wonder why this occurs and is there any suggestions on how to avoid this situation as I find it quite frustrating. Second question relates to getting comparisons of two birds on the same screen. Although the instructions on this website say it’s easy to do, there are no explicit directions on how to do it and so far I haven’t been able to figure out how to do that. We have not encountered the bird song bug you have described but will investigate immediately and release a fix as soon as possible. Regarding your second question – to initiate a comparison you should, from any of the bird listing screens, tap on the “eye” icon at the top right of the screen – the birds within the list will then present tick-boxes from which two can be ticked and thereafter presented in comparison. Please let us know if you are unable to locate the icon or it does not work as intended? I`m hoping to run this on an iPod Touch with wi-fi. Does the app require connectivity to work or once downloaded and installed will it work when I’m hiking around? Hi Jeff, the app is completely self-contained and does not require any Internet connection to run once it is downloaded. Apologies if this question has been addressed already – I have the Samsung Ativa (windows) cell phone. Is this wonderful app available for this system? The Sibley app will run on your Samsung Ativa (windows) cell phone. I currently have the lite version on my iPhone4 but I don’t have a lot fo memory. How much memory is required for the full version? Thanks for your interest Kenneth. The full version requires just under 500 MB of storage, as all the pictures and sounds are stored on the phone. 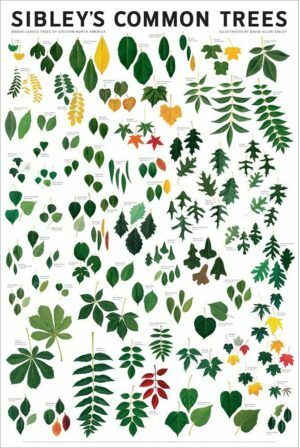 what about putting the tree book on an app? Have the digital earth team moved offline? I can’t find their website?! Apologies if this has been covered, but want to make sure. I just recently purchased the app for my Android, but am now changing to iPhone (both under ATT). Sorry, but I’m afraid none of your apps will transfer to the new platform. The operating systems on the phones are different, the app stores are not linked, and the companies behind them (Google and Apple) don’t offer any way to transfer a license from one to the other. I wish they would, but they have very little incentive to do that. Bump to this question! I’m in the same boat. I have an Android, was thinking about switching to iPhone, but really don’t want to have to re-buy the app. I get that Apple still wants to make money off it, but is there any way you can give some sort of coupon to those of us who already bought the app on a different platform? Must my Kindle be connected to the Internet? I’d like to take it into thew field and be able to play songs. Thanks. All of the content is included in the app, resides on your device, and is fully functional without an internet connection. I still can’t say for certain, as discussions are ongoing, but I’m optimistic that we can continue the existing app and update it, which will be a free update for current users. I was wondering if it would be possible in a future release to allow users to add a custom location in the “My Location” selector. This would allow users to limit the lists in the program to show only the birds on a custom list. For example I currently live in Vancouver and do most of my birding west of the Coast Mountains but when I select BC as my location I get a bunch of species from both the Interior and from the Peace Region of British Columbia which is east of the Rocky Mountains. I’m sure I’m not the only user of your app who finds the state/province lists overly broad. Will this app work with the Nokia windows 8 smart phone? 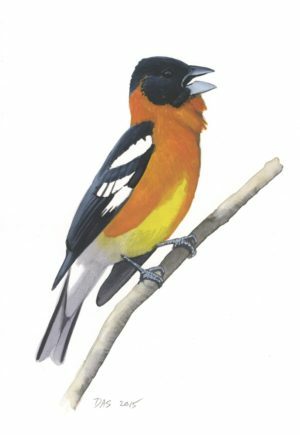 Yes the Sibley eGuide to Birds of North America app is available through the included Marketplace app on your Windows Phone 8 smartphone or through the online marketplace at the link below. 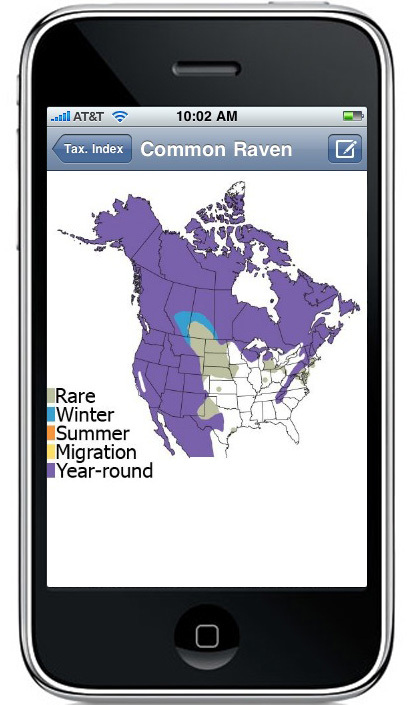 The Audubon app has a sync capability to their online site. I love this as a back up and for ease of data entry at home when making a paper/pencil list in the field which I can again sync and updates on my phone. Is this something you could look into adding? I much prefer your app to theirs, but this added feature I find very useful as I have already lost my list once when my phone was damaged and having to re-enter all my data was, to say the least, time consuming. THanks! Hi, I would like to know if this app, when downloaded, requires an Internet connection to fully operate, including all of the sounds? My wife has an I-phone 3GS without Internet, so the app would need to be totally self contained. Hi Kevin, Yes, the app is completely self-contained on the phone and does not need any internet connection after being downloaded. I love the idea to get this ebook in my tablet! instead to carry my dear sibley guide to watching bird. greets and glad to know a little more about you Mr Sibley. I’m not quite sure if you mean the Samsung Galaxy S2 phone or Samsung Galaxy Tab 2 tablet? Regardless, the Sibley eGuide app will work perfectly on both of those devices. If you would like to test the app before you purchase then you may want to download the free version first? I noticed in the recent preview of the 2nd edition Sibley guide David mentioned that the “plan” is to have to have the 2nd edition app out at the same time as the paper edition. I know schedule issues are always in flux, especially three months out, but I’m curious if the plan is to offer the 2nd edition as an update to the current app, as an entirely new app, or some sort of hybrid (In app purchase upgrade or similar)? IE, should I hold off on buying the current app in preparation for the new version? Also, are all current platforms going to continue to be supported? I’m planning on buying for Windows Phone 8. Looking forward to the new version. Already have the hard copy pre-ordered. Hi Josh, Yes, we are working on getting the app ready and hope to have it available in March when the new book is out. Discussions about pricing are ongoing, and all options are still under consideration. Android 4.2.2 Jelly Bean, Google Play Certified on it. Any problem with the app working on this device ? The app should work perfectly on your device. Re: Will The Sibley eGuide to Birds App working on y Kobo Arc 7. I downloaded the Lite version per your suggestion and it works fine and because it does I will be ordering the new App when it comes out next March (or so. Very impressive, looking forward to March. Will you be working on a version for the Windows Surface, Windows Surface 2, and Windows Surface Pro tablets on the market? These are 10″ tablets running Windows 8 or Windows 8.1 software. Is there a firm date for the release of the new edition android app? I would like to know when it will be available. Will there be any credit for existing users of the current android app towards the purchase of the new app? 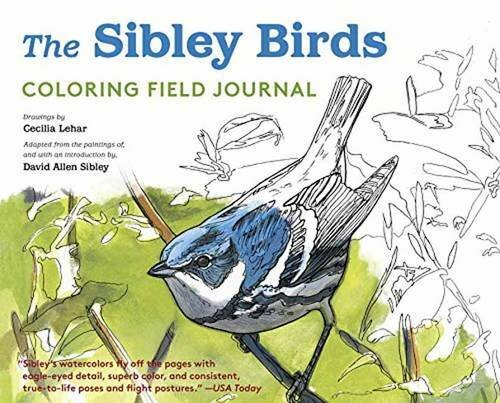 What is the status of the Sibley eGuide to Birds app – SECOND EDITION ?? Will there be an app version for ipad mini with retina? When will the 2nd Edition of the Sibley eGuide to Birds Android app be released? Are there any details available at this time? Why are we not getting any answer to our question as to when is the 2nd Edition of the Sibley eGuide to Birds Android ??? Kevin Grams asked this question almost a month ago and in my case almost 2 months ago, what’s up with the delayed and in fact non response?? I just got a handheld computer (Juniper System Archer 2) for collecting field data and it has Windows mobile installed. Which application, if any, would work best for this device? We currently do not support that version of Windows mobile with field guide apps, The device in question is normally not used for field guide type apps. Your app is great, I used it with my nokia lumia while out birding today. The thing is I was able to play the Black and White warbler song and had the bird come very close for great photos. It would be nice to have real pictures as well as the ones displayed but I like the app overall. Hello. I downloaded the Sibley app a year or two ago and have found it very helpful. For some unknown reason, the audible bird song feature has stopped working. I have it on my iPod where it has worked before and I still get other recorded material from the device. Any idea what may have happened? There should be no reason why the audio stops working, we have however had issues before when the operating system is upgraded, you may need to uninstall the app and then do a reinstall, this should resolve your issue. 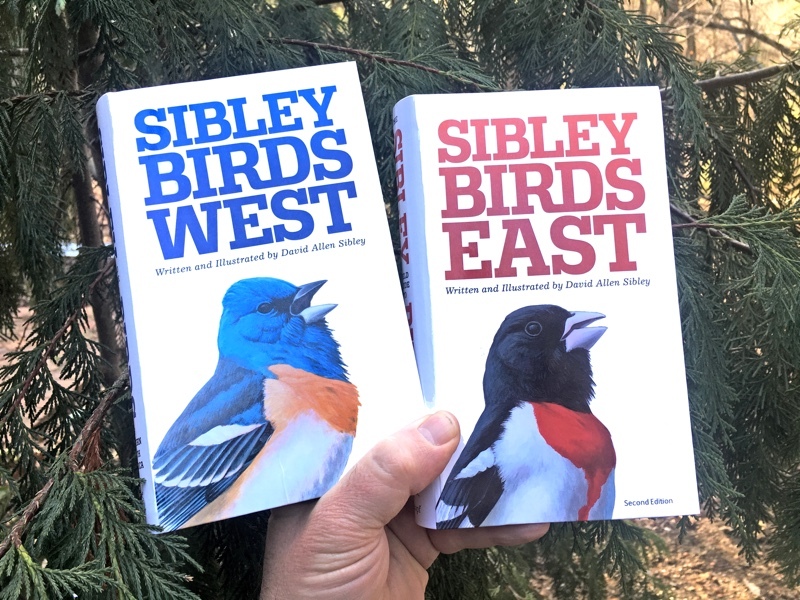 Since the Android 1st Edition of the Sibley eGuide to Birds did not receive the update that the iOS Version did earlier this year, I would especially like to know when the 2nd Edition of the Sibley eGuide to Birds Android app will be released? Are there any details available at this time? Additionally, will there be any credit offered to the existing users of the current android app towards the purchase of the new app? Sorry for the late response, we are currently busy with the 2nd Edition of the App at the moment, it is close to beta stage and we are hoping to have a release date within the next 6 – 8 weeks. We will post an estimated release date here in the coming weeks. Any Android experience running the app on a Nook Color with a N2A card for upgrading the android system? I have the android app on my galaxy Express and love it. Is there a version that would work on a computer? There is a version that will work on a PC, provided the PC is running Windows 8 Operating System. Herewith the link to Windows Store. So with all the taxonomic changes and your updated hard copy book, I’m wondering when you intend to update the app? I purchased the full iPad version a couple years ago. I have had to reset my iPad and have lost the big version. I have installed the lite version. How do I get the full version back? or do I have to buy it again? Hi Brian, Thanks for your interest. Work on the revised app is ongoing, but still no firm release date. Hi Ellayne, If you have switched platforms or are using a new ID then none of your apps will transfer to the new phone. As long as you are connecting to the same app store as before (iTunes, Android, etc) with the same account ID, the app should be available in your account to download. If you haven’t switched platform or ID, and you are still not able to download it, please let me know either in a reply here or through the “Contact” button above, and we will help troubleshoot. It’s Nov. 25 and I’m wondering if you have any news about 2nd edition. I’m headed to Florida at the end of Jan and would really like the app by then. As there is no transfer relationship between Android and Apple you would unfortunately have to buy the app again through the iTunes store. Our apologies for the inconvenience. Do you have an update on the projected release date for the eGuide to Birds of N.A. app? I use your app almost daily. Thanks for your interest. We are still working on the app, with no definite release date yet. I changed my android phone, transferred the Sibley Bird App to new phone but got stucked with MyDigitalEarth for downloading apps data, please help. We were experiencing connectivity issues on our servers this weekend which resulted in downloads not being served reliably. Could you please close the app and retry the download and should you still be unable to complete the installation please contact us on support@mydigitalearth.com so that we can assist in resolution. We apologize for the inconvenience you have experienced. I love the new 1.9 version for iOS, thank you. Except for the list now being alphabetized, I hope that you will include an ability to choose, or default to taxonomic listing. Hi Theo, the list should not have changed in the update, and you should still be able to find the taxonomic list. Check on the main menu (tap top left to back out to that screen) and you should see an option to choose between taxonomic or alphabetic list. If that doesn’t solve your issue please let me know and we’ll get on it right away. In the previous version when you opened the vocalization page you got a list of vocalizations to choose from whereas in the new version opening the window starts the first cut in the list automatically. Frustrating. Seems like a bug that could be fixed easily? Hi Paul, Thanks for the comment. There is a new update that fixes this issue now. I have the Sibley eguide on both my IPad Air and also on my IPhone 4S. I’m keeping “My List” up to date on the IPad. I see that I can export the list to an email. I’d like to somehow import the list to my IPhone. Better yet, I’d like to be able to sync the two devices. This must be possible on the IOS system since I have another app (SplashID) that allows the the IPad and IPhone to sync using WIFI with a PC version of the app that exists on my Dell PC. Purchasing the SplashID app for the IPad allowed the PC version to function. Could you look into the possibility of allowing this functionality on the Sibley eGuide? The only other feature I miss on the Sibley app is having a running total of species entered in “My List”. That would be helpful in comparing success from year to year. I’m hoping that could be a future improvement as well. You briefly mentioned that you guys are working on updating the app. I would like to suggest something that could have a significant impact on birding and connecting with other birders. I use RunKeeper to track my hikes and runs. I am able to invite others who use the app to see my runs and hikes, along with pictures that I may have taken along the way. This would be cool for other’s to see the lists and encourage and be encouraged to get out and see some birds. Also, to connect with other birders that may have comments about specific areas or what they saw on that specific day-sort of like a “wall” area to post experience. Maybe that is what you guys are already working on. Anyway, it would be cool! Thanks for all your help with birding David! 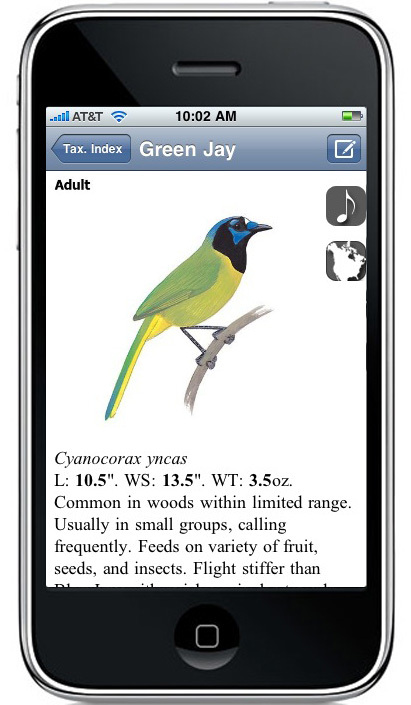 Is there a release date yet for the The Sibley eGuide to Birds App, Second Edition, for Android devices? If so, when is this expected to occur? Is there a firm release date yet for the Android version of The Sibley eGuide to Birds App, Second Edition? I purchased the android version 3-4 years ago. I recently upgraded to an iPhone. Do I have to purchase the iPhone version or can the android license be transferred? If it can be transferred, how do I go about making that happen? I do not have a Compare button as described above. Version 1.6.8 running Android platform on Samsung S5. When I go to Playstore it says I have the app installed, have not got any update notices. I’ve forwarded this question to the developers and you should hear from them soon. The compare function is toggled by tapping the “eye” icon at the top right of the screen on the index pages – please see the example screenshot below. Once toggled, tick boxes will appear to the right of each bird and tapping 2 tick boxes in succession will launch a comparison of the chosen species. Should you not see the icon please send an email to support@mydigitalearth.com with a similar screenshot showing the index page as it appears on your device so that we can investigate and resolve the matter as soon as possible. 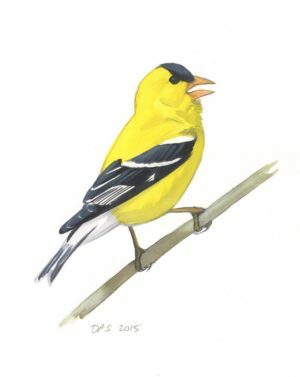 Is there a date set for the release of the ne Sibley birding app? I was under the assumption it should be out by now. Is there a way to arrange My List sightings so that it lists the birds alphabetically within each group? For example, all warblers listed alphabetically within the group “Warblers.” As it is, my list is alphabetical without regard to the group. If I could group them, I would know at a glance how many warblers are on My List. I use this app regularly on my phone running Windows Phone 8.1, and am contemplating upgrading to Windows 10. Can you tell me if the app is compatible with Windows 10, and if not, when you plan on releasing a version that is? I just installed the app on a Windows 10 phone and it works very well. I would love to have a version useable on my MacBook Pro computer. Operating systems are different and all the aps for i-phones/i-pads won’t run on the computer. Any thoughts about adding this? I don’t have a smart phone but I do have a non-Apple tablet. Can I get the app to work on that? It’s a Lenovo product. 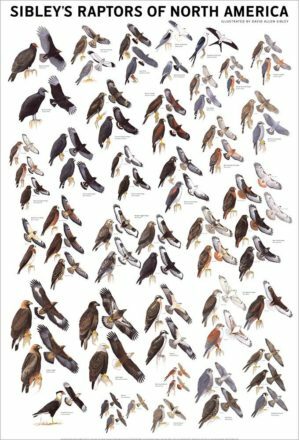 Great guide books (we have at least 3 of the different US bird guides (the big one and the separate East & West ones): for the house, various cars, etc!). Using a Samsung Galaxy S6 and don’t see that specific phone listed in the drop down on Google Play. What am I missing? Would really like to get this app! Thanks. I was going to buy your app and then noticed that I had to allow you to know when a call is active and what number I am talking too. Is this only during the download? I have a bird at my feeder I’m trying to identify. They are about the size of a small Bluejay, mostly black, with black feet and beak, a bright yellow head and chest, and white patches on the front of the wings. I live in Topaz, California. Can anyone help me find out this birds ID? Is there a Sibley’s e-guide version that I can get for my PC? Is there a problem with exporting the list with the “SD Card (ebird.org format)” option? I also get this same error on an LG Android tablet. My Sibley Guide v.1.6 (android) has stopped working. I was getting a storage error message, but still had some functionality. Read online that an update correcting the problem had been issued. I uninstalled and then reinstalled the app. Now it does not work at all. When I try to open, it requests ability to make and manage phone calls. Why would this be necessary? I deny the request, and the app will not open. Is there another correction coming? My Sibley guide for Android has stopped working. I was getting an error message about storage. I uninstalled and then reinstalled the application. Upon opening, it asked for permission to make and manage my phone calls. This seems more than a little unusual. I denied, and now the app will not open. Please advise. I was thinking about buying the Sibley for my smart phone because I’ve like the book but don’t generally want to haul it around on hikes. At least in the free version, it’s still (2 years later) asking to manage my phone calls including specifically knowing who I’m calling. I can’t fathom why this app would need that ability and am not interested in buying the electronic version if that is part of the paid version also. Hi Lenore, I’ve asked the developers about this. My Sibley guide for Android still does not work. I believe I have the most recent version. Have accepted all provisions. Continue to get storage error message. Can you fix this? Hi Ron, I’ve forwarded each of your messages to the developers and they will be in touch to help you solve this issue (if they haven’t already). Thanks for using the app, and for your patience while this gets fixed. Can this app be shared with Apple’s “Family Sharing” features? If not, could you please consider allowing it as I would love to share this app with my wife. She really wants it but for as much as she will use it, will not pay for it a second time. Thank you. Yes, the app has Family Sharing enabled. I cannot find the the Piliated Woodpecker on the app, and see on this website back in 2012 someone asked about the New York list missing the bird……I’m in Wisconsin, but that shouldn’t make a difference, right? It’s still missing on the app, and I’ve got 2 in my yard….Whassup? Love the app, other than the missing parts. My mistake….I forgot to change my location back to Wisconsin from a recent trip to AZ, and that explains it. Pls disregard and/or delete both posts. Have you some new about your new edition of the Sibley EGUIDE to birds. With new nomenclature ? Thank you and have a good day ! If I download this app will I be able to check out bird sounds and descriptions when I have no access to wifi or internet of any type. 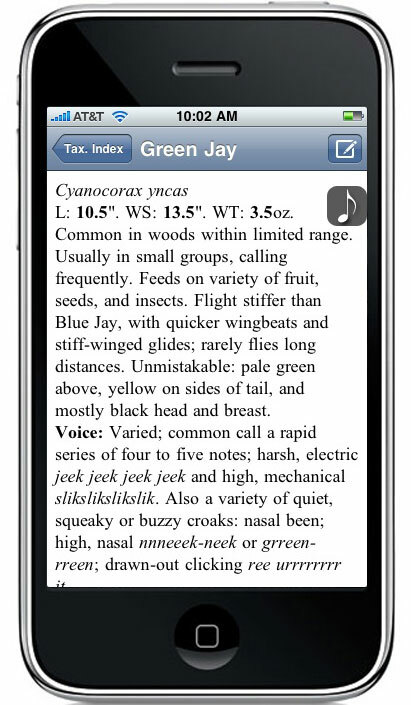 The app contains old bird names (i.e. Sage Sparrow, Western Scrub Jay). Is there a plan to update the app with the latest taxonomy changes that ABA suggests? I wish this app would do a big update. 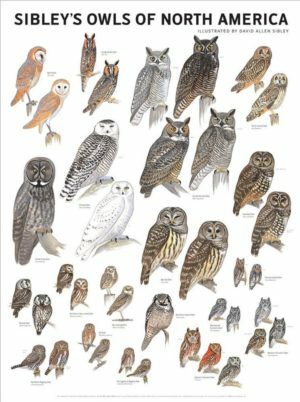 I live in Alaska were there are several species of Owl that have been regularly spotted. For example Western Screech Owls are regularly seen and heard along the southern coastal regions. We also have Barred Owls that have been seen in Juneau and other Southeastern Regions of Alaska. I know there are other bird species that are making their way up here and it would be nice if an update occurred. It looks like if range maps were updated that would certainly help. Hi David I am bit frustrated by the latest update to your App. By the way I have three of your hard copy publications and I have a 4th thstbi gave to my Grandson. Back to the App. I saw that it was available at a discount which said “ mid – Dec”. I could not afford it at the time but on the 15 of Dec I logged on to the App Store with the intensions of buying that day. The price went up and the developers in their email reply to me were not very sympathetic. I thought the 15 of Dec would still be mid Dec since there are 31 days in the month.